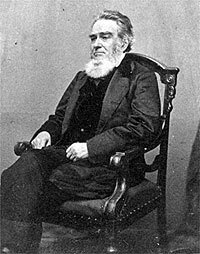 Attorney General under President Lincoln, Edward Bates was somewhat estranged from the rest of the cabinet before his resignation in 1864. In 1860, he was promoted as a candidate for president at the Republican National Convention. His previous support of Know-Nothings, especially in the 1856 presidential race, made him an anathema to German-Americans. His candidacy was pushed by New York Tribune editor Horace Greeley and the Blair family, but opposed by others who thought the Republicans need a younger, more vigorous candidate. He never actually joined the Republican Party and remained an unregenerate Whig who strongly believed in the Union and internal improvements. Conservative by nature and stuffy by temperament, he opposed slavery but disdained blacks. His tenure as Attorney General was notable for the inconsistency of his legal judgements. 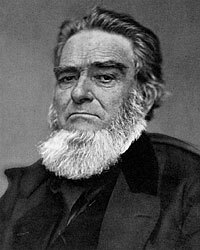 Bates was a former State Senator and one-term Whig Congressman (1827-29) who lost a Missouri Senate race to Thomas Hart Benton before returning to state political and judicial posts. He chaired the River & Harbor Convention in Chicago that Abraham Lincoln attended in 1847. During the Civil War, one son Fleming Bates served with the Confederates and another, John C. Bates, served in the Union Army. His youngest son, Charles, spent most of the Civil War at West Point. Noah Brooks, Mr. Lincoln’s Washington, p.136 (March 13, 1863). Brian McGinty, Lincoln and The Court, p. 213. Frank J. Williams, “‘Institutions are not made, they grow:’ Attorney General bates and Attorney President Lincoln,” Lincoln Lore, Spring 2004, p. 7. Williams, “‘Institutions are not made, they grow:’ Attorney General bates and Attorney President Lincoln,” Lincoln Lore, Spring 2004, p. 5. James McPherson, Battle Cry of Freedom, p. 533. Stephen Sears, Controversies & Commanders, p. 90. Allan Nevins, The War for the Union: War Becomes Revolution, 1862-1863, p. 313. Howard K. Beale, editor, The Diary of Edward Bates, p. 280. Beale, Diary of Edward Bates, p. 220. Burton J. Hendrick, Lincoln’s War Cabinet, p. 406. Michael Burlingame and John R. Turner Ettlinger, Inside Lincoln’s White House: The Complete Civil War Diary of John Hay, p. 220. David M. Silver, Lincoln’s Supreme Court, p. 196. Helen Nicolay, “Lincoln’s Cabinet,” The Abraham Lincoln Quarterly, March 1949, p. 290. John G. Nicolay and John Hay, Abraham Lincoln: A History,” Volume IX, pp. 343-344. Beale, Diary of Edward Bates, p. 473 (April 15, 1865).